In Bergen, Norway, there is a span of land called the Isdalen Valley, parts of which are also sometimes nicknamed Death Valley (no copyright infringement intended). Perhaps it might come as little surprise, then, that someone would choose to dump a body there in 1970. 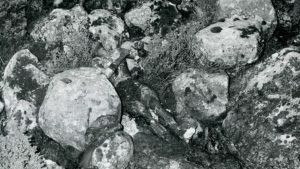 When a man and his daughters were hiking the Isdalen Valley that year, they stumbled onto charred remains of a young woman who would leave Norway–and an international audience that would speculate on what had happened for years to come–with the mystery of a lifetime. The body was home to a boatload of evidence that would amount to very little in the way of determining how she came to that place. Judging from the materials on her body, she was may have been a drug addict. There were about a dozen sleeping pills on her person, an empty bottle of liquor, and two bottles of petrol that were likely used to start the fire that left her–and her passport–burned to a crisp. The autopsy concluded that she died of carbon monoxide poisoning. She also had upwards of fifty sleeping pills in her system. Had the stream of evidence ended there, it might have been concluded that she committed suicide by a variety of means. Alas, the stream of evidence did not end there. The fire had left her face unrecognizable. She showed signs of being in a recent struggle because of bruising on her neck. Someone used sandpaper to make her fingerprints disappear. Although it seems like someone went to quite a bit of very gruesome trouble to ensure that no one identified the body, they seem to have missed one tiny detail–her teeth. They indicated that she had probably had work done as far away as Europe or South America, although the exact location could not be identified. Investigators went on to find two suitcases thought to belong to the Isdal Woman at the nearby Bergen railway station. They found money, clothing, a lotion prescription, partial fingerprints, and diary entries that pointed to cities the woman had perhaps visited. Labels were absent from the clothing, as were the signature of the prescribing doctor and the date during which the lotion was prescribed. It seemed that every new avenue led to a dead end in the case. Investigators located a man who had provided the woman with a car ride and also joined her for a dinner. Although he provided them with details about the cover story he was given, it was readily apparent those details were fabricated. Eventually it was learned that the unidentified woman had traveled Europe with no fewer than eight fake passports, and that those who met the woman knew she spoke many languages. Later, a man came forward to tell investigators that he had seen her hiking with a couple of men just days before her body was discovered. He believed she had been about to speak, but that those same men interrupted her and kept on moving. It is unknown if this story is true. This case is still a source of intense international curiosity, and even today agencies operating in Norway are openly seeking new information to find out more about the woman and the factors surrounding her death. So far, this is all we know–and perhaps it is all we ever will. Previous Previous post: Why Is The Mystery Of The Somerton Man So Appealing? Next Next post: Why Is Amelia Dyer One Of The Most Notorious Serial Killers In History?